New Passepied: I'm not sure if the new direction is totally my thing (drums sound really muddy in particular) but man, their sound has needed a shakeup for a long time so I'm all for this. Their set will be streamed next weekend! Second weekend stream already confirmed better than first weekend! Mixed feelings on this one. Chorus is pretty nice, verses are just ok, but the intro/bridge/outro/whatever with the "ooh ooh" is awful. I agree with crominance, though. They could use a shake up and I like the general direction of the song, with the vocals a bit subdued and the instrumental a bit more "lush", but in this song specifically it leaves a bit to be desired. 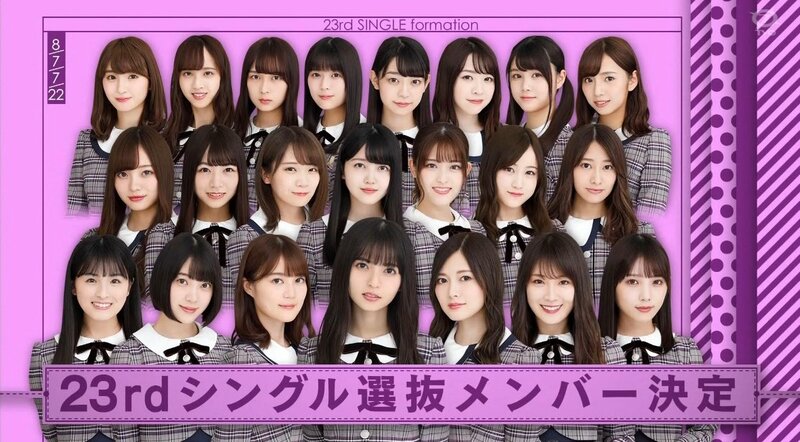 Senbatsu for Nogizaka's 23rd single revealed two days ago. Largest one to date with 22 members. Yamashita is taking a short break since she's busy with a drama (and other stuff I assume), so that's a shame. Pretty sure she would've been front row. Eito, Wakatsuki and Nishino's graduations mean that 3 spaces that were untakeable for years are now free, though I guess the returning Kubo and Kitano (2nd row on top of that!) will be the new core members. Cool to see Sakaguchi and Watanabe getting their 1st senbatsu. Takayama earned her front position thanks to the massive sales of her book I guess (I love her so yaaay). It's been a minute since Hori got a front position too. Looks like they're starting to push her again. Better than the vocoder on DISCOMMUNICATION at least. Deerhoof are touring the States. I'll be catching them on Sunday in Chitown. Kinda a Japanese band so thought I'd throw that out there. Kinda wish he'd released a video for Rope, that song goes hard. Found a new group I like! Thanks! I havent been by this thread in a while, but man I feel like J Pop/Rock is real good right now. And yeah, the past two/three years or so (2019 included) have been a blessing. Already established acts are also bringing the heat. I feel like I enjoy each year more than the previous one tbh. Super healthy rap/urban scene too. Great time to be a Japanese music fan. I went out of my way to buy Mrs Green Apple's CDs when I visited Japan recently, and Aimyon is evergreen on my day-to-day playlist. Such good stuff! Been listening to it since its release, I dig it. Track produced and arranged by Tondenhey from Odd Foot Works, that's an unexpected collab. Would be cool to see her doing more stuff with artists that are more on the hip-hop spectrum like them. She did a live yesterday where she only performed new songs, hopefully a new album is coming soon. Speaking of Odd Foot Works, their new album is out next week, can't wait! They say that the song has a 9mm Parabellum Bullet feel to it and yeah, I totally hear it. I just can't wait to hear his new album, one of my most anticipated releases of the next two months, along with the new Fomare, Passepied, Sakanaction, Nogizaka46, Keytalk, and go!go!vanillas. Lol, they got Time Machine 3-Gou this time. I'm all for having comedians in every MV they release. KANA-BOON releasing a new single on june 12, really like the cover art. Good to see the actress Kishii Yukino again! She's been in a few of their MVs already, so I wonder if they'll continue the same story. The song is currently used as the OP for Sarazanmai. They sound fantastic live! Even with all the movement around the stage. Love that song. Bradio's new single coming out this week. Always loving new Bradio music. They're really getting better live, especially the vocalist. First saw them in 2015, and his voice could be a little hit or miss. Saw them a year later, and a third time in 2017. It's night and day. Really enjoying this young band Miami Party. Funnily enough, the song features a cool rap duo I've discovered hours before. For the SxSW performance they had cameras all around the crowd that they could use to make make a 3D representation of the crowd on the fly. Edit: oh, the last song? Yeah, that's screen overlays and camera work. Can’t go wrong with any Kana-Boon or Oral Cigarettes albums tbh. Just get TIME from the former, and Kisses and Kills from the latter. Noko produced a track for GOMESS. I'm pretty sure this was made exactly for me. Lol I'm currently listening to the album without checking who produced the tracks beforehand, and when that song played I was like "Huh, this sounds like something Noko would do". Really digging it so far.